FLISP Subsidy – 7 Home Owners can save R 1,758 249.00 million on their home loan repayments! This week alone we assisted many home owners to save millions on their home loan repayments. The FLISP subsidies to be paid into their home loans will help 7 home owners, who can save up to R 1,758 249.00 in total on their home loan repayments. We processed many more – but the 7 are a good example. Who earns R9 900.00 per month, qualified for a 100 % home loan of R355 000 and opted for a 30 year home loan repayment. She can receive a FLISP subsidy of R50 575.00. If she was to pay off her bond over 30 years, prior to the FLISP subsidy, she would pay back the capital loan of R355 000.00 plus interest of R 862 069.00 resulting in a total repayment over 30 years of R1 217 069.00. If her FLISP subsidy of R 50 575.00 is paid into her bond account, and she continues to pay back the same initial instalment to the bank, she will pay back her home loan in 14 years and 11 months and save R514 520.00 on her home loan repayments. When we approached various lending institutions, we were told by many that ‘We do not deal with FLISP, it is a Government Subsidy”, but once we started showing them the benefits of a subsidy paid into a home loan, they soon changed their attitude as the FLISP subsidy, once paid into the bond account, reduces the risks for a bank. Our aim is to save first time home buyers even more. To register for a FLISP subsidy application – NB – You must have a prior home loan approval – go to www.flisp.co.za and register. In the Western Cape we can assist with applications if the owner took transfer not longer than 12 months ago – and in some other provinces they allow a shorter period after transfer. Go to www.flisp.co.za and register. I have been asked many times – how does the financial side of a rent2buy transaction work? 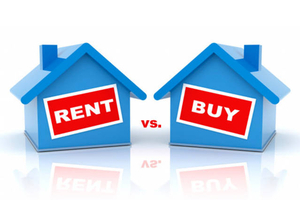 Herewith a simple example – remember each rent2buy or ALA transaction is calculated on it’s own merits. The parties agree on a purchase price of R1 million for the property. The current market related rental is R 7500.00 per month. As a home owner – would also pay rates, taxes, levies and insurance – of +/- R 1 200 per month. fails to exercise the option – the landlord retains all money paid as rent. The rent2buy buyer applies for a home loan after 12 – 24 – 36 months. The parties agree on a purchase price of R1 mil. Capital and interest paid back over a 5 year period (Note – the purchaser can accelerate the payments and apply for a home loan during the term of the agreement and take transfer, register a bond and settle the full purchase price in cash. Due to that fact that the purchase price is “crammed” into a 5 year repayment period – the monthly instalment is very high – this can be negotiated between the parties and reduced if a large deposit is put down. Contact me for a full calculator. Peer to Peer lending or financing has existed in South Africa for the longest time. The stokvel system used in farming communities is one such example. Essentially peer to peer financing is a way of funding financial transactions without the involvement of the bank. A peer to peer property sale is one of these financial transactions. Peer-to-peer lending commonly abbreviated as P2PL is the practice of lending money to unrelated individuals, or “peers”, without going through a traditional financial intermediary such as a bank or other traditional financial institution. This lending takes place online on peer-to-peer lending companies’ websites using various different lending platforms and credit checking tools. Many also use the abbreviation “P2P” when discussing the peer-to-peer lending or investing industries more generally. The contract between the seller and the buyer is laid out much like that of a bond, with certain amounts put aside for the saving of a deposit that will be used to get acquire a loan to buy the property outright at a later stage. This deposit is often the stumbling block when it comes to purchasing high value commercial buildings. While a peer-to-peer transaction looks easy to put together it is a combination of 7 years of research work by de Waal and his team. They combined existing, tried and tested products and services to create a complete set of legal agreements that ensure both the buyer and seller come out on with the best deal possible. “We do a very comprehensive due diligence on both the buyer and the seller to ensure they are financially sound enough for such a deal to be put in place. The buyer must meet out stringent requirements as we are not willing to put all this together just for it to flop back in our faces a few months later,” says Meyer. The Seller is provided with extra services such as monthly rent collection, rental guarantee and legal costs protection, should the unfortunate need to evict a non-paying tenant ever occur. The rental income is protected as part of the product, underwritten and managed by a rental guarantee company with a track record of more than 12 years. This rental guarantee gives the seller extra security and peace of mind. Our legal team prepares the agreements in one of two ways: a Rent-to-Buy scheme or an agreement commonly known as an Instalment Sales Agreement. Both these agreements have their own particular applications and the most appropriate agreement is applied for each transaction. Like all great ideas it started with a pen, paper and a little maths. My first thought was to compare rent paid vs. mortgage repayments and other expenses to own a property but also consider the capital growth on the money invested. I soon realised that doing things “by hand” was never going to work and I enlisted Deon, an IT wizard, put it all in a neat spreadsheet. This changed all my calculations. This is how the “Rental vs Buy Calculator” was born. We are still in the testing phase and would love a little feedback! If you’re wanting more information please keep reading! If you wish to plug your own property portfolio into the calculator you can contact us to receive your very own demo version! If you rent a property valued at R1 million, you can expect to pay between R6 500.00 – R 8 000.00 per month rental for that property. If you buy a property of R1million, you can expect to pay back the bank R 9 321.00 per month if you were lucky enough to negotiate a home loan interest rate of 9.5 %, close to the current prime home loan rate. However, chances are you ended up with something a little higher. If your interest rate is a mere 2 % higher at 11.5%, you can expect to pay back the bank R10 664.00 per month. Not a lot per month you may think, but the 2% extra adds up to 32% more over the duration of a 20 year repayment. That’s almost R 320 000 more to pay back your bond! “As a tenant you usually do not have any responsibility to pay additional expenses like rates, taxes, insurance and levies. However, if you own your own place you can easily add another R2 000 – R2 300 per month to cover for these expenses over and above your home loan repayment,” says Meyer de Waal, a conveyancing attorney. How it’s time to get tricky with the numbers: If we add all the payments of a home owner together in one year, the R1million property could end up costing you R111 856.00 in annual bond repayments Bond (R1million x 9.25 % x 20 years) and an extra R27 000.00 for the “additional expenses”. This leaves you with an annual total payment of R138 856.00. Now, if you were to rent the same property for R7 500.00 per month your only expense would be the R90 000.00 in rent for that same year. A home owner will then pay a staggering R48 856.00 more compared to a tenant, in year one. There is some hope for the home owner! The tenant might have to pay less but will enjoy no capital growth – all his money is helping the landlord pay off his bond. If the property value grows at 8% per year, the home owner’s investment will increase in value with R80 000.00, leaving the property to be worth R1 080 000.00 after one year. On a growth basis, the property owner will be R58 856.00 out of pocket. The best returns with owning a property is usually achieved over a longer term of ownership, but I did some calculations, what would be the returns, should the owner decide to sell after year one. If the property is sold after that period, the seller will have to pay the estate agent a sales commission. Commissions of estate agents are usually 5 % (plus VAT) and can go as high as 7 % (plus VAT) of the purchase price. If the property is sold for R1 080 000.00, with the 5 % (plus VAT) commission (plus VAT) of R61 560.00 payable to the agent, the property owner would be left with a “cash in hand” profit of R18 440.00 on the sale alone. However, the owner has to take into account the bond and “other property expenses” of R111 856.00, which leaves the owner making a significant loss on the investment. “It appears not to make any financial sense to sell the property within a year, unless a much higher sales price can be achieved,” says Meyer. The tenant, if he follows sound advice, can invest the difference he would have paid, compared to what he would have paid, if he owned a property and be in a much better cash-flow situation. The tenant’s rent usually increases each year between 8 – 10 %, meaning that after 5 years the rent will be R111 856.00 per year (calculated on an average increase of 9% annual increase) and the tenant would have paid a total of R538 624.00 in rent over that 5 year period. When looking at the home owner over the same period of time – If no major interest rate hike was introduced or if the home owner fixed his interest rate with the bank (keeping home loan repayments the same) – we can see if investing was worthwhile. Let’s assume a 12 % escalation for rates, taxes, levies, insurance and maintenance expenses per year, leaving the home owner to pay R175 339.00 for these expenses and R559 279.00 to the bank towards the home loan after 5 years. The total expenses of the home owner will sit at R 734 617.00 and must be set off against potential 8% compounded growth of the property over the same 5 year period. With this growth the property will increase in value from R1million to R1 469 328.00. This leaves the home owner out of pocket to the tune of R265 289.00, as his capital growth is R469 328.00 and his expenses R734 617.00 (Capital growth of R469 328 – expenses of R734 617). If the property is to be sold, and agent is paid, the loss will increase even more as the estate agent must be paid. After 5 years, only +/- R84 000.00 capital of the initial R1million home loan would be repaid. Over a period of 10 years, if the growth stays the same and rates, taxes etc increase at a similar rate, the home owner will pay R1 602 902 towards the home loan and “other related expenses”. By the same time, with an 8 % capital increase every year, the value would now be R2 158 925.00. Only now would the owner be in a positive position due to a larger portion of the capital of the home loan would be repaid – at the 10 year mark the outstanding capital on the bond ought to be R756 959.00, from the original R1million home loan. The tenant, facing a 10 % rental escalation each year would have paid in total R2 219 602.00 rental over 10 years. If the tenant had the discipline each month to save the difference between his rental paid and bond and other expenses, he would have an investment in his bank account. After 20 years, the home loan ought to be paid off and with a steady capital growth of 8 %, the property will be valued at R4 660 950.00. The expenses towards bond repayments and rates, taxes, levies and maintenance amounts to R 4 225 762.00. It is a nominal profit, but at least the bond is paid off and, if the property is sold, the cash value will be R4 660 950.00 (less agents commission). This does look like a “break-even” situation, but compared to the tenant who paid rent of R4 944 160.00 over the past 20 years and has only his savings to show (if it was invested wisely-and if invested at all) , the home owner does seem to be sitting pretty with a property paid up in full, no future rental costs and a potential sale if he so chooses. The question – does it make sense to invest in property or is it just a forced savings plan? Abovementioned scenario is calculated if a home owner is to pay off his own residential home loan, with no outside help, like rental income. It appears to be around even with the rental paid over such time and can be regarded as a “forced savings” structure, as you end up with the close to the same money that you invested. If fact many property gurus will advise you that it is not a good idea to buy your own home, rather rent and invest the extra money that you will have each month and enjoy better investment growth. “To improve your return on investment, get a tenant to help you fund your investment,” says Meyer. Now consider if you buy a property of R1 million and rent it out, you will collect R90 000.00 rental income in the first year. Your tenant will pay you R7 500.00 per month and the rent ought to increase with 10 % each year. This means you will only need to contribute the shortfall until the rental escalation per year catches up with the shortfall. In the first year, after payment of the home loan of R111 853.00 and the rates, taxes etc of R24 000.00, it will leave a shortfall of R 45 852.00. Based on the same percentages, it ought to take few years to break even, considering no major increase in interest rates. Looking at these calculations, investing in property remains a good and solid investment. To receive a copy of the calculator, send an email to Meyer@oostco.co.za and apply the calculations to your own properties and send us some feedback.